Hello, Friend! I’m writing with exciting news! 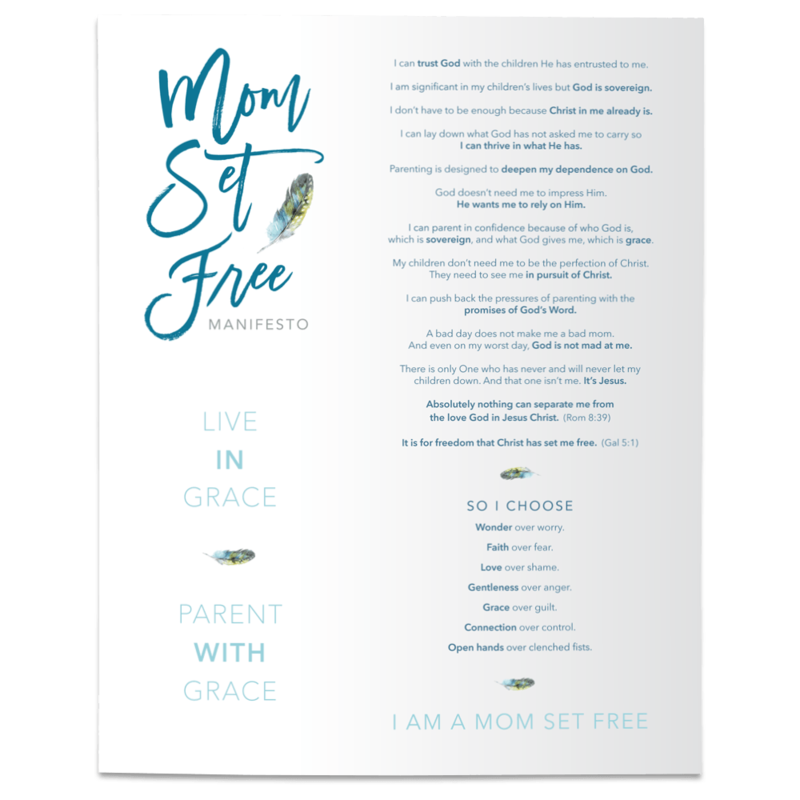 The Mom Set Free Bible Study is now available AND I have A LOT of copies to GIVE AWAY!! I couldn’t wait for this day to get here to share this study with you because I’m a Bible Study girl and I don’t know what I’d do without my Wednesday morning Bible Study crew. I know how powerful and beautiful it is to study the Word of God alongside other women who also want to grow closer to God. And now you can do just that with the Mom Set Free Bible Study! So gather a group or just grab a friend and discover together how to parent as a mom set free in this 7-week Bible Study - which even has optional downloadable videos for each week. You probably have a lot of questions like “Well how is this different from the book?” and “What if I’ve never led a Bible Study group?” and “What will I get out of this study?” All of those questions and more are answered here. You can even download an entire free chapter right now. But I’d like to give you a quick glimpse into the study today. See, one of the things we do in the Mom Set Free Bible Study is identify ALL of the different pressures we are under as moms. The pressure to orchestrate a picture perfect future for your children. The pressure to be a perfect example for your children to follow. The pressure to create a saving and vibrant faith in your children’s lives. The pressure to produce Christlike character in your children’s lives. The pressure to shield your children from the ungodly influence of culture. The pressure to protect your children from hardship and/or suffering. The pressure to ensure your children fulfill their full potential and purpose. The pressure to prove you have it all together in front of other moms. The pressure to earn God’s pleasure in the way you parent your children. Each one of the pressures listed above holds an impossible standard or unrealistic expectation, which is in bold. Is it just me or was even the mere exercise of naming those pressures exhausting and overwhelming? And of course, we could have kept going. This isn’t an exhaustive list. Is there one (or two or all nine) that jumped out at you? Which ones do you feel most weighed down by in your parenting? 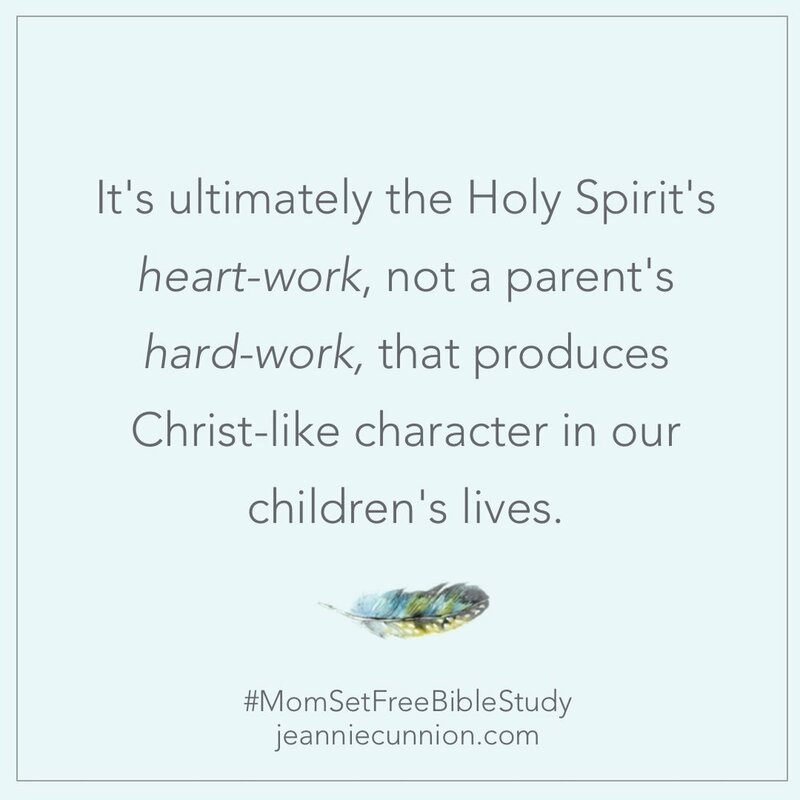 For example, of ALL the different pressures we are under as moms, one of the pressures I felt the most profoundly was the pressure to PRODUCE Christ-like character in my kid’s lives. The righteous character we so desperately want to see in our kid’s lives will ultimately be the fruit of their salvation, not our hard work and handmade charts. It will be produced by Jesus Christ, not by our persistence. This doesn’t mean that our efforts are unimportant. Of course they are. But we can’t anchor our hope in them. Part of God’s purpose is to produce character in the lives of His children. And all of this will bring much glory and praise—not to our parenting—but to God! God has commissioned us to shepherd our child’s heart, but He is the One who shapes their lives in His likeness. How freeing it is to know that as we seek to give the grace and truth of Christ to our kids, it’s the Holy Spirit’s work alone to inspire them in heartfelt trust and obedience. Do you see how naming these pressures isn’t about us having a collective “poor us” or “woe is me” moment? It’s just the opposite, actually. This is us acknowledging and bringing into the light the pressures that weigh us down and seek to wipe us out SO THAT we can speak the all-powerful promises of God’s Word over them. Because if we don’t apply the promises of God’s Word to the pressures we face, we will get stuck (and we will stay stuck!) in some pretty awful places and patterns. The pressure leaves us stuck bouncing between worry and fear, with clenched fists that are trying to control outcomes. It leaves us stuck feeling guilty about all that we’re not compared to what every other mom seems to be. It leaves us stuck feeling angry—angry that no matter how hard we try, we aren’t getting the results the parenting books promised us we’d get if we followed the right steps. It leaves us ashamed—ashamed over our shortcomings and weaknesses that are daily revealed through our mothering. And ultimately, it leaves us hopeless. Why? Well, mostly because all of our hope is in us. We think that if we just keep trying harder, we will finally become the moms our children need us to be. But we’re exhausted. It’s just no way to live. It’s not how our Heavenly Father wants us to live. There is a better way! Becoming the moms we long to be doesn't happen by trying harder and doing more to be enough for our kids. It happens by relying more on God. And so much of the pressure we experience, and so many of the places in which we get stuck, stems from us getting this backwards. God wants our hope anchored in HIM, not in us. He wants us to trust Him with the kids He has entrusted to us. So I hope you’ll grab a friend or gather a group and dive into this study together. Let’s lay down our worries and our fears and our guilt and everything else that God has not asked us to carry as moms so that we can thrive in what He has!! Let’s make 2018 the year we REALLY discover what it means to parent in the freedom for which Christ has set us free! Now about that GIVEAWAY! This is SO good! Share this post on Facebook by clicking the FB share button below. Tag me (Jeannie Cunnion) when you share it. Comment below to let me know you’ve shared it.